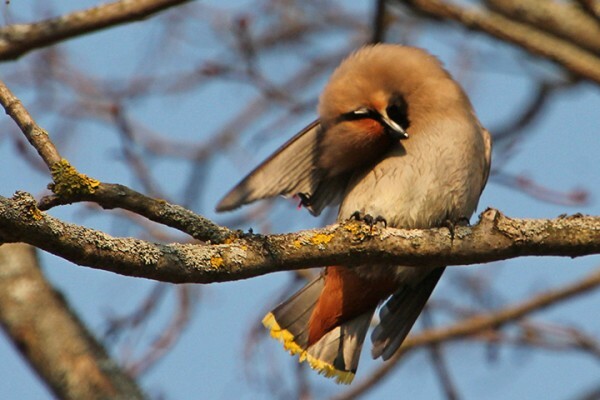 Guests of our reserve, invited to the anniversary round table in the park hotel “Vozdvizhenskoe”, waited a very pleasant surprise. Each of them were given wonderful gifts. 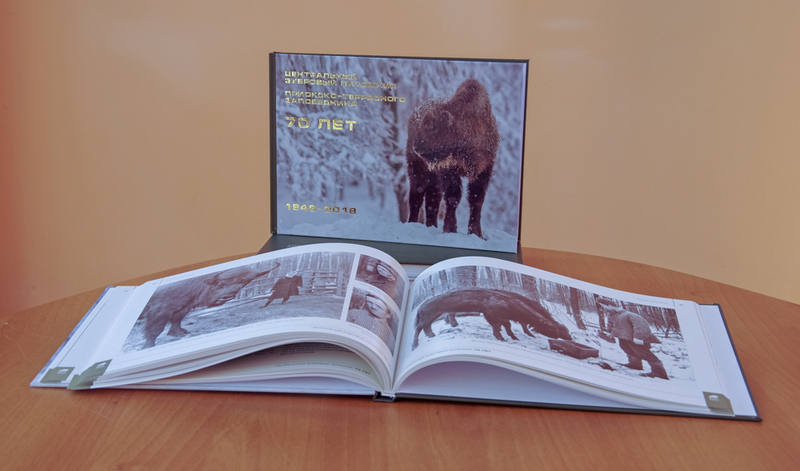 Right before the anniversary, an illustrated album “Central bison nursery of the Prioksko-Terrasny Reserve. 70 years.” was published. It includes the entire history of the Nursery since its founding in 1948 and to our days. The reserve team has been working on this edition for almost a year. For the album were selected absolutely unique historical photos, many of which have not yet been published. Among them are wonderful portraits of not only the founders and workers of the nursery, but also the legendary Bison with their names – the ancestors of the purebred herd, which lives today in the nursery. These photos were made by not less legendary workers of the nursery in the 50-60s of the last century. Pictures over a half century of age incomprehensibly reflect the touching love of bridges to their wards. In addition to archival photos, the color animalistic works of our best contemporary photographers demonstrate the life of bison at all times of the year, in all its picturesqueness and primeval nature. The text of the book, written by zoologist Viktor Pererva, will literally tell the reader everything about the life of bison in captivity and in the wild, how the species of animals, almost disappeared from the face of the earth, was restored by scientists, about all the ups and downs of the 70-year history of the Central bison nursery. The book already promises to become a bibliographic rarity – its circulation is only 300 copies. This gift, presented to each of our guests, made a great impression. The release of commemorative medals dedicated to one or another significant event is a well-known tradition. 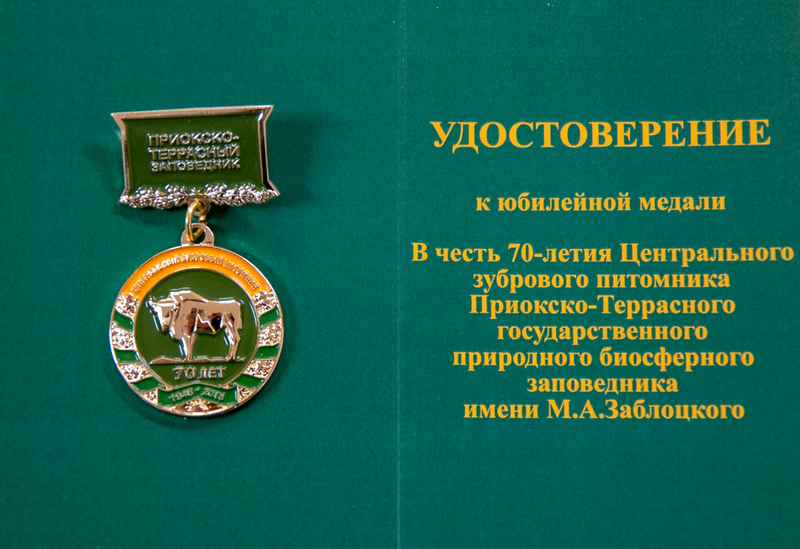 The Prioksko-Terrasny Reserve also followed this tradition, releasing nominal medals in honor of the 70th anniversary of the Central Bison Nursery. 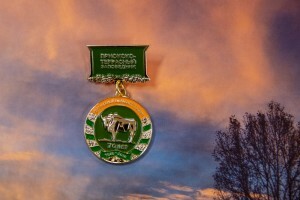 But it turned out to be not just a medal, but a real order, where a mighty Golden Bison stands on a green field surrounded by a commemorative inscription. 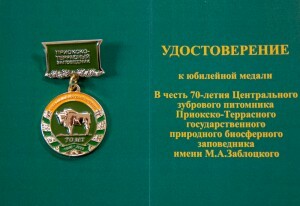 A badge of identification with the signature of the director of the Prioksko-Terrasny Reserve Evgeny Grigoriev is also attached to this badge. Anyone who has received a commemorative medal can now consider himself a holder of the Order of the Golden Bison. Many guests immediately put on these insignia and wore it with pride. 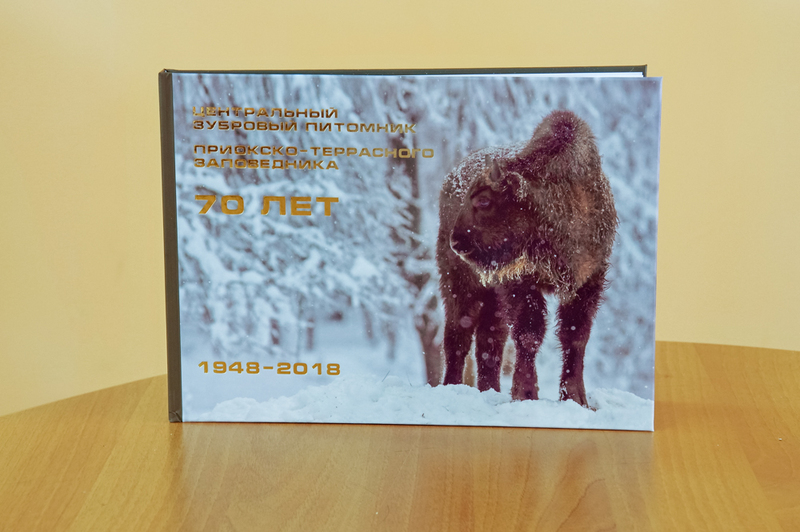 All this will be remembered by our friends and colleagues, will be preserved in family archives, in the collections of the directors of our “bison” nature reserves. Dear friends, once again we congratulate all of you on our common holiday!